Mercedes-AMG G63 Performance, Engine, Ride, Handling | What Car? From the moment you thumb the starter button, the monster that lives under the bonnet completely dominates the driving experience. It roars aggressively and, despite being 1.5 litres down on its predecessor, the V8's 577bhp and staggering 627lb ft of torque are enough to tow 3500kg. Its real party piece, though, is the ability to fire the G-Class down the road at a right old lick. Yes indeed; despite being styled like a shipping container and weighing in at more than 2.5 tonnes, 0-62mph takes a barmy but massively impressive 4.5sec, with top speed limited to 137mph. However, while a Bentley Bentayga or Porsche Cayenne Turbo will just squat and go when launched, the G63 can sometimes struggle to deploy all of its power in the dry, let alone on a damp road, even with four-wheel drive to help. You feel the nose rise like a ship in a storm as the tyres squirrel away beneath you trying desperately to find some purchase on the road. Seriously, press the naughty pedal with any conviction and it feels less like an SUV than an overpowered hot rod, and frequently has to be brought to heel by its overseeing electronic nanny. 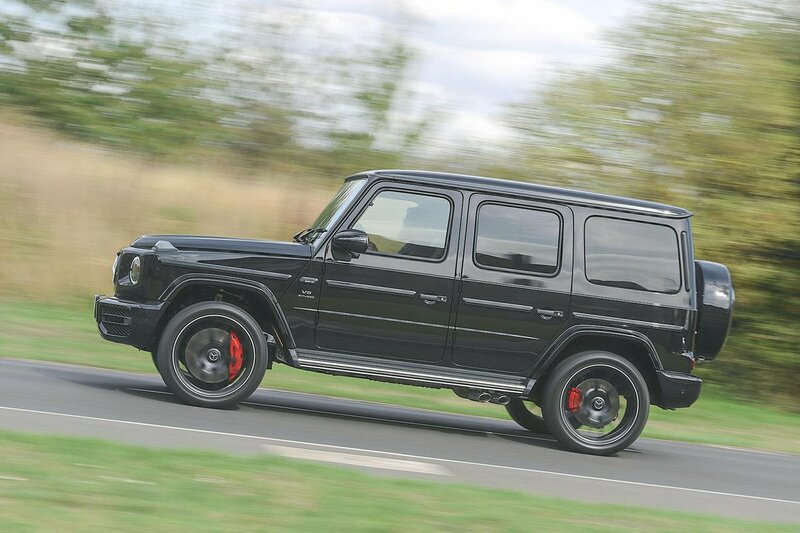 Despite weapons-grade acceleration, the G63 most certainly does not put the 'sport' into 'sport utility vehicle'. Even with wide tyres and adaptive suspension, grip is in relatively short supply around corners and, again, the stability control is quick to intervene. 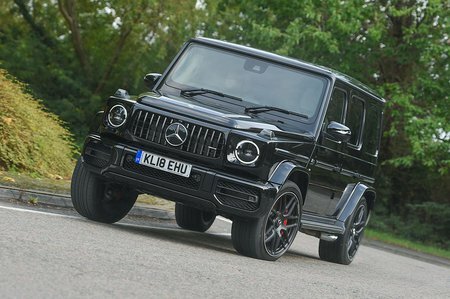 The heavy body pitches in bends noticeably, and the G63 feels ever more cumbersome the harder you push. Try to thread it down a twisty road with gusto and the leaning becomes even more pronounced. Yes, you can engage a harder suspension mode, but you still get plenty of roll and the car remains unwilling to change direction quickly. We're back to that hot rod reference again, because this is an SUV that feels far better suited to going quickly in a straight line, while corners are taken at a gentler pace. The G63 isn't an especially comfortable cruiser, either. Our test car’s big 22in wheels and relatively low-profile tyres didn't help, but the main culprit is the suspension system. It may have 21st-century adaptive dampers, but the live rear axle that so helps off-road prowess causes the car to jostle and heave around on scruffy road surfaces. Your head will be thrown around on undulating country roads, even in its comfiest setting. Given that the basic layout (independent front suspension and a live rear axle) is the same as you’d get on, say, the Mercedes X-Class, it's no surprise that the G63 feels very much like a well-sorted pick-up truck. 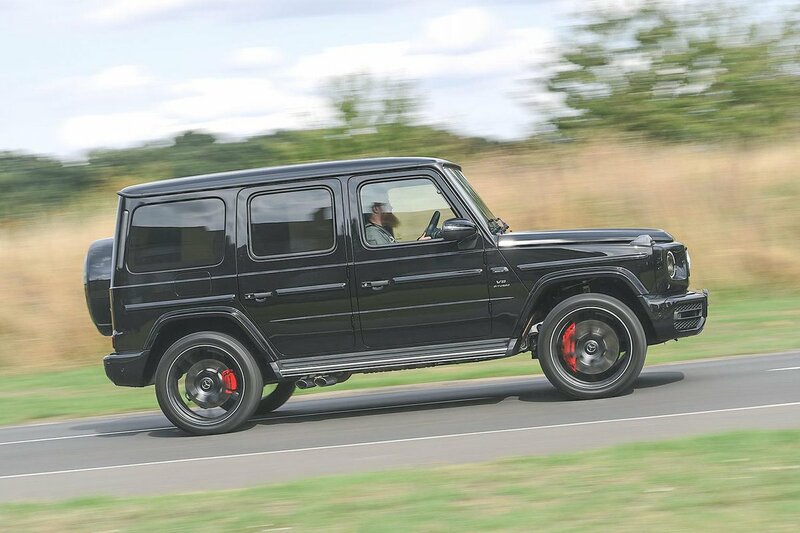 That said, while it isn’t great by the standards of the class, it'd be missing the point of the G63 somewhat to sign off there. After all, if you want a modern performance SUV, you'll probably be looking instead at the much faster Mercedes GLC 63, which will also cost you a lot less. The G63, though, has always been a rugged 4x4 in the old-fashioned sense, and this updated version holds true to that. Indeed, a low-range gearbox, those differential locks and its suspension travel means the G63 really is very capable in the rough stuff. And even if you're not willing to risk scuffing its expensive alloy wheels doing something as crazy as taking the car off road, there's something rather nice in knowing that if you needed it to, it could. It's worth pointing out that the latest G-Class represents a huge step forward for ride and handling compared with its predecessor, and the G63 offers a charm that no crushingly competent modern sports SUV can get close to. For many buyers, that’s a big part of the reason for buying one.